I really loved the short film that played before the movie too! La Luna totally inspired my project today. Can you guess what I've done? If you want to attempt this, and I highly recommend that you do, latex (or non-latex for you allergy sufferers!) gloves will be your best friend. Put on your gloves and squeeze some of the glow-in-the-dark fabric paint into your hand. Then just run the yarn (I used 100% cotton yarn) through your closed hand and it will coat it fairly evenly. I looped the yarn over the towel racks in the bathroom so that it wouldn't stick together as it dried. 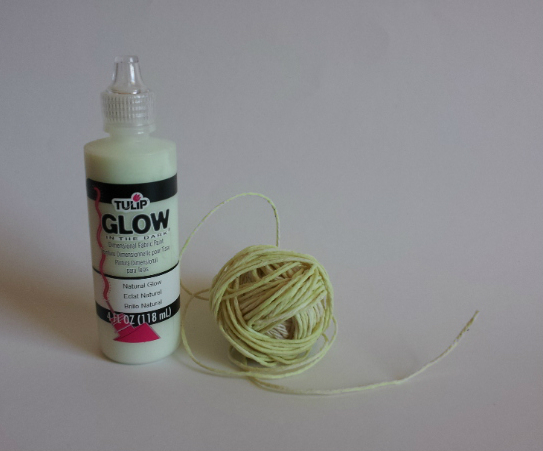 Once it was dry, I rolled it up into a ball, and now I've got a big ol' bunch of glow yarn to play with. I made some of my stars for Mims, because she loved La Luna too. We hung one on her ceiling. She tucked the other one under her pillow. She calls them her wishing stars. They glow really brightly! I was wasn't expecting much, so it was a really lovely surprise when they practically lit up the room. It's a softer glow than a glow-stick, but it was still bright! 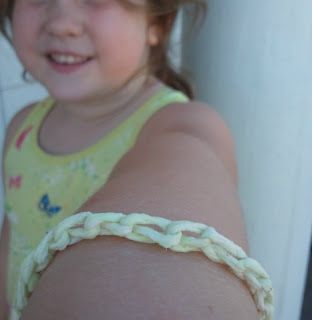 I made a couple of glow bracelets for us, which have been a big hit. Even Jake wanted one. I can imagine that they would be loads of fun at a slumber party... All I did was just a quick chain long enough to go around our wrists, and then tied them with a surgeon's knot. So simple!!! You could make a ton of these for a party in a few minutes. I will say that the yarn is not soft when it's been glow-painted. It's pretty rubbery. 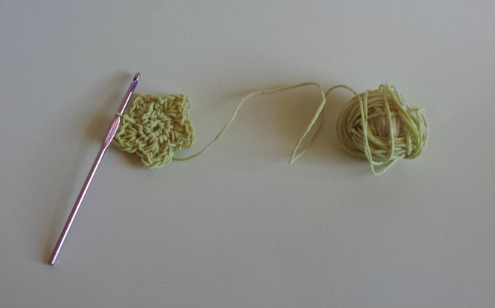 It doesn't slide smoothly when you crochet with it. For our family, it was totally worth the hassle of fighting a little bit with it to make it work. I made Mim's stars with one side glow-y and one side plain cotton-y, so she had a glow side and a snuggle side. The glow side is not the least bit snuggly. 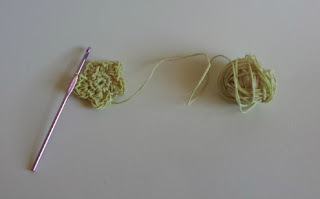 I had a revelation while trying to work with the 'painted' yarn. I crocheted first, painted (Dabbed with a sponge brush)second, then assembled the stars and half moon for my granddaughter's mobile in her room. She loves it and I didn't have to fight the stiff yarn. And Jaime is correct that cotton yarn works best for this, either way. I love the idea of making a stuffed version soft on one side as these do get 'rubbery' feeling. You are brilliant, Dani! 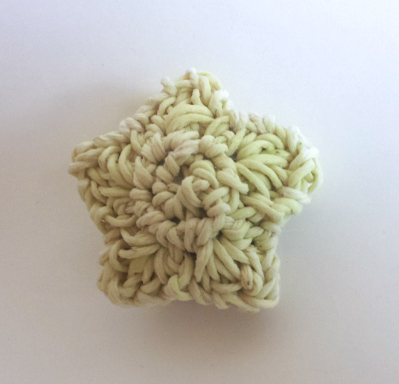 It was pretty rough working with the painted yarn, but when I made it I wasn't sure what I was going to do with it. It would have been much better to paint the stars after I had finished them. Ah, next time! I pinned your post though, because this is genius!! Whenever I see things like this for sale I always think "How Awesome!! I wish I could buy some but it's *just so expensive!!" Aw, thanks misfitknits! Thanks so much for the kind words -- this really makes my day! How long does the glow last? (days, weeks, months etc)Do you have to keep reapplying it to the star? Hi Monica! The glow paint is awesome. It is "charged" by exposing it to light for an hour or so. The glow lasts for a few hours, but it can be recharged over and over! Mimsey's star still glows! I don't see any reason why I'd need to reapply the paint. I'm pretty sure it's going to last forever! Lol! This is a genius idea! Have you tried washing your projects? I'm wondering if the paint would wash out.